Two and a half-hours from Bangkok, lies one of Thailand's premier courses - the Jack Nicklaus designed 18-hole Springfield Country Club of Cha-am. Opened in 1993, this intriguing course will provide a challenge for golfers of all standards as they thread their way through well-placed hazards to greens of the highest standard. Accuracy is required at all times as the fairways are flanked by a series of hillocks and covered by a forest of small trees. With five sets of tees to play from, Springfield is a championship course in the true sense of the word. The course is classic Jack Nicklaus with large areas of sand and well-appointed water hazards while offering the average golfer a fair challenge when played from the standard tees. Off the back markers, there are some big carries just to reach the fairways. Springfield is one of the best maintained courses in Thailand with excellent clubhouse facilities. 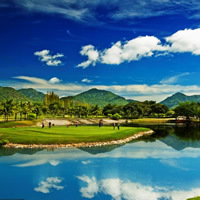 It is very popular with the majority of the Hua Hin-based touring professionals who practise there regularly to keep their game finely tuned between the Asian PGA Davidoff Tour events.